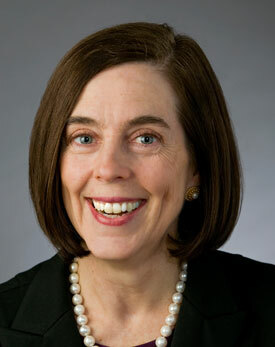 Kate Brown as she is pictured on the secretary of state’s website. John Kitzhaber’s resignation elevates to the governor’s office Kate Brown, and this raises the possibility and the hope that the executive part of the state government will actually get things done. The office may change the way she operates, but I hope not. I don’t know her well, having met her when she was a senator in the 1990s and talking with her occasionally after she became secretary of state. But in my contacts with her and her office over the years, I have come to think of Brown as direct, forthright and not much interested in endless process. John Kitzhaber was big on policies and process and looking at things in the long term. Just look at the endless study he initiated on better rail passenger service up and down the valley. The study process is necessary, but a governor more determined to get results would have lit a fire under the people doing the work. What actually happened under Kitzhaber? Rural Oregon’s tepid economy did not recover. The bridge across the Columbia did not get built. The state’s website to operate Obamacare did not get finished. Running the public schools got more top-heavy without any boost in results. Cities suffered from unresolved flaws in the law on public employee bargaining. Federal forest policy remained bad and unchanged, and some counties lost almost all law enforcement as a result. Some of these things are outside the governor’s direct control, but an energetic governor eager to improve the lives of Oregon citizens and taxpayers now, not in 20 years, would try harder to move the dial. She can’t be too bad. She displayed uncommon common sense by fining the Albany City Manager for violating election law and won the support of the DOJ who now fight Hare’s appeal to the Oregon Court of Appeals. With that said, I’m not certain she can win election outright to the governor’s office. I’m not sure she and the baggage she brings have sufficient statewide and national appeal. The key will be the R’s ability to identify a credible opponent…..and I don’t see one today. Who’s going to manipulate the elections/voter registration in her place?